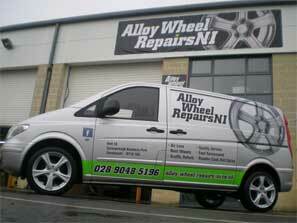 Welcome to Alloy Wheel Repairs NI, a Northern Ireland specialist in alloy wheel refurbishment and repairs. Based in Dundonald, covering Belfast, Newtownards & Bangor. We provide top quality alloy wheel refurbishment and repairs in Northern Ireland. Established 2008 we offer a fully insured, quality & professional service in all aspects of our business with a fast turnaround. We aim to provide a superior level of finish. Services include, Wheel refurbishment, Partial repairs, Powder Coating, Straightening buckled wheels, Diamond cut finish, Split rim repair, Colour matching, Custom colours, Tyres, Puncture repairs, wheel balancing, locking wheel bolt removal, Courtesy Car. Based in Dundonald we primarily service the Belfast, Bangor, Newtownards and north Down area. Have a good look at our gallery, feel free to send us an e-mail or make a phone call. For a written quote please drop in and see us.